The Greeks normally drink ouzo with a splash of water which dilutes the alcohol and causes it to go cloudy—a louche effect that you also get with absinthe. The only other way we had it in Greece was with orange juice. It only took a moment of consideration to conclude that my cocktail could not use ouzo as the primary ingredient by volume. Its flavor is so pronounced that it would easily dominate the recipe. I decided to try combining it with calvados because, like ouzo, it's not used very often in my house and I was intrigued by the idea of adding apple to the mix. After squeezing some lemon juice for a basic sour formula, genius struck as I grabbed the cinnamon syrup. Shake with ice and strain into a chilled cocktail glass. Garnish with a large twist of lemon peel. The cinnamon syrup which was almost an afterthought, really makes this drink in my opinion. Plain old simple syrup might work as a substitute and still produce a decent sour, but the cinnamon is so nice with the apple brandy that it's worth going back to the Zombie post from October and mixing some up just for this drink. The spice is subtle and not overbearing, and its sweetness doesn't clobber the lemon. You might need to adjust to your proportions to taste. As for the ouzo, it isn't hidden by the other ingredients. It's right there for you to taste, though not overpowering at all. Ouzo has a strange numbing effect on the tongue that I can't really explain. I get the same reaction with absinthe, so perhaps there is some botanical similarities—or maybe it's just me. I'm not generally a black jellybean lover, but I like this cocktail because that flavor is subtle. 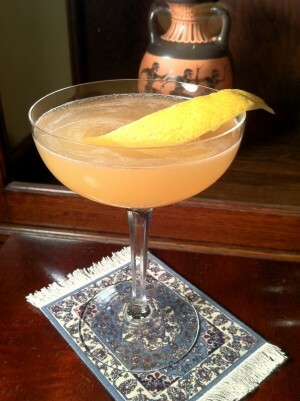 It reminds me of the Corpse Reviver #2, but I like this a little better. Naming a cocktail is always an interesting process. This one went through a couple names before I settled on the Circean (SUR-see-an). It's a reference to Circean Poison—a magical drink that is both infatuating and dangerous. This comes from Greek mythology, and more specifically, Homer's Odyssey in which the enchantress, Circe, lures Odysseus's men and transforms them into swine. Obviously, my drink isn't all that dangerous, and the only transformation you will experience is maybe an insatiable appetite for precision cocktails. Still, I like the name, and overall, I think this ouzo recipe works nicely. I am pretty sure my father-in-law thinks so too. I never heard of ouzo, but after reading your article made try and find were i can buy one and try your recipe, thanks for sharing.